The choice for a stacked bar chart. The stacked bar charts create a white space between the years. This elicits the impression that there might be missing data in between the years which is not true. An area chart would have been the default design choice to show the relative change of the percentages over time. This would have fixed the white space issue. The color legend is center of the viz and blocks the view. No information is lost by locating the color legend on the red bars for the white ethnicity, but the design feels off. The color choices are counterintuitive. The black and white ethnicities are represented by the colors green and red. This could lead to increased cognitive load. Only as late as in the mid-1960s, did the first Asian baseball player debut in the MLB. I had to think for some time, what to do with this viz. The intuitive thing would have been to just convert the stacked bar chart into an area chart and show the increased diversity in the MLB or highlight the increase of Latino players. However, I became curious about Asian proportion of player since the line for the Asian ethnicity starts long after the other 3 ethnicities. I did some Wikipedia research and discovered some fascinating facts about the first Asian player in the MLB who is responsible for the first bump in the prior flat lane of Asian players. Originally, I also wanted to annotate and enhance the backstory of the second bump in 1994. But unfortunately, I was not able to find additional information about the player who caused this bump. 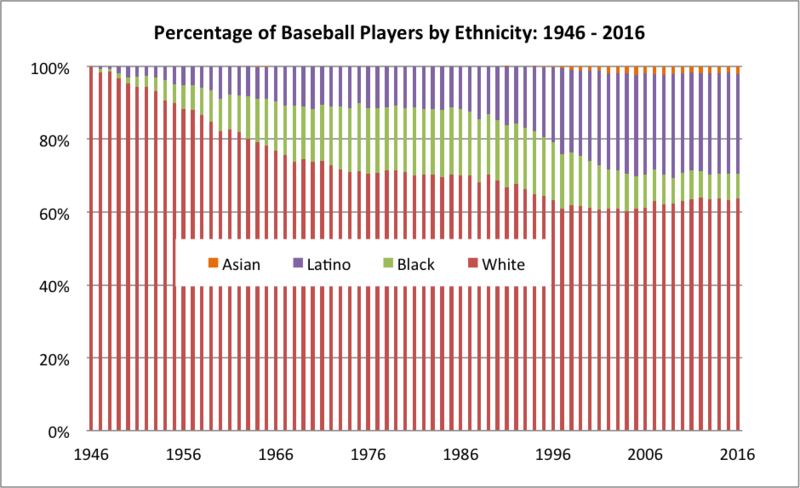 I opted for a simple line graph and filtered out the other ethnicities to magnify the small increase in the Asian Player pool. I chose the blue of the MLB Logo as a background color. For the color choice, I am still not 100% sure if this is the way to go since I do not really like this color scheme. But I did want to create some resemblance to the MLB Logo, so I stuck with it.